Can I just say I love the holidays!! 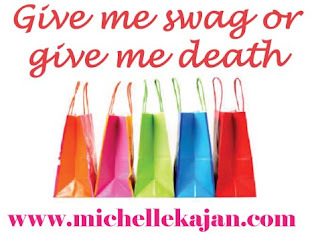 The hot trend this holiday season is personalized swag. If it doesn't have your monogram or name on it then it MUST have a clever little saying that speaks to who you are. 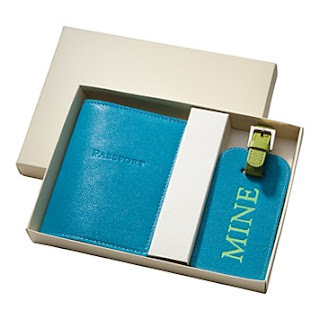 This cute little travel set reminds me of my simple little 1 1/2 year old who only understands that everything she touches is "MINE!" What's wrong with that!! 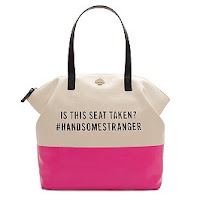 Kate Spade never ceases to amaze me with their adorableness! Here are some new bags in the line that are beyond creative. 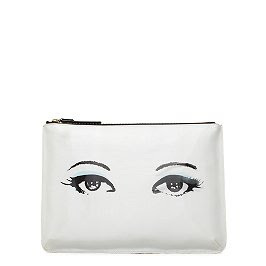 The first clutch has simple graphics of eyes on it and the second a tote bag with a clever has tag message. Unique, creative and most importantly this brand understands how to speak my language which I think speaks volume to marketing and targeting a specific demographic. Is your promotional message penetrating and speaking your target consumers language? Something to think about. Anyway I speak Kate Spade.... you'll soon find me toting the "All hours winking Georgie -clutch" around Los Angeles, when it arrives from my recently online purchase! I don't know about you but during Christmas my family congregates at my moms house, where we open gifts, eat and play boardgames all day long. 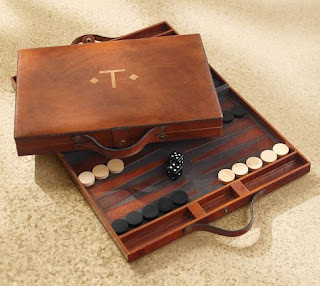 The Holiday's are upon us and I'm loving this Leather Backgammon Set. With it's vintage feel and monogramming option it's the perfect personalized gift for any family fun night. Available at PotteryBarn.com. Behind every great pair of heels is a cozy sneaker supporting you. I'm not even sure what I meant by that but if the shoe fits, well you know the rest! These fab Be&D Big City Silhouette Sneakers are available for sale at Neiman Marcus in case you were wondering. I think i love the idea of this sneaker so much because I often suggest for my own clients to "think outside of the box." You can really make an ordinary product, extraordinary with a great piece of art. 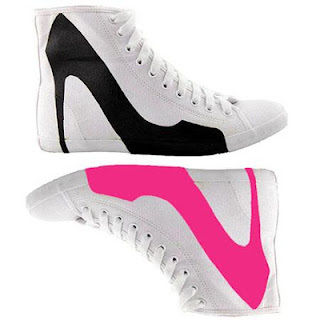 There's a clever synergy to this simple graphic concept on a white sneaker and I LOVE, LOVE, LOVE IT!